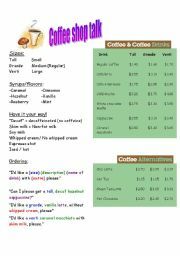 A worksheet that covers the basics of ordering coffee in a coffee shop, including choices for size, type of drink, flavors, and specializing orders. The menu could easily be used for a role-plays involving taking orders, and giving drink orders. Fun for any fellow coffee-addicts. Plus, Starbucks is pretty much the same everywhere! 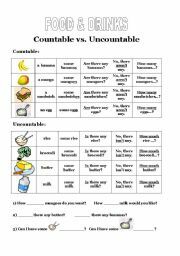 A worksheet to show how to form phrases, sentences, and questions related to countable/uncountable foods and drinks. 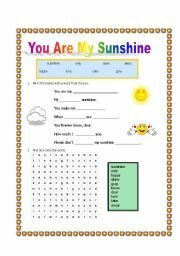 "How much" vs. "How many"; "is/isn´t" vs. "are/aren´t"
A simple worksheet for young learners to teach the chorus of "You Are My Sunshine". 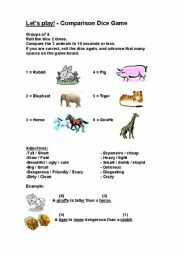 Includes fill in the blank (cloze) and word search. A great easy song to spice up a weather lesson! 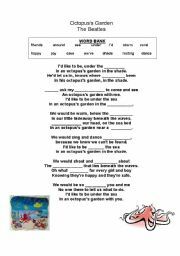 A cloze worksheet for listening to The Beatles´ song, The Octopus´s Garden. 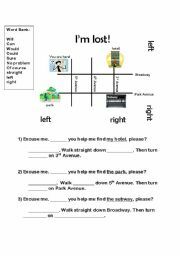 A worksheet to practice asking for and giving directions, using a simple map, street names, and the directions "left", "right", and "straight."